SORRY! THERE IS NO 2019 CALENDAR, PLEASE REMEMBER US IN 2020. Recycle Your Used Printer Cartridges! You can help GRROWLS while shopping at Amazon.com. 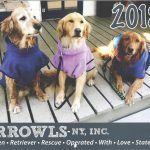 Amazon will donate .5% of your purchases to GRROWLS if you designate GRROWLS-NY as your charity of choice at: http://smile.amazon.com/ch/14-1795123. After you register, it’s important to sign into Amazon as you normally would, using Smile.Amazon.com as your sign in website.